September 21: I woke up to another beautiful, clear day! It was extremely annoying since I really wanted to get back and finish the Colorado Trail and I hated the idea of wasting such a beautiful day sitting around town, but the snow storm was still expected to blow in tomorrow so wait I did. Although "sitting around town" didn't appeal to me, and I learned about a gold mine that was open for tours about five miles outside of town. I could walk there if I had to, and walk back. Ten miles on a beautiful day like this--no problem! Without carrying a heavy pack? No problem! On a nearly flat road? No problem! Today would take me into the Old Hundred mine. Not that I was particularly excited about walking ten miles that weren't on the trail--and less excited about the out-and-back nature of the walk. (I prefer loops!) I'd rather make it a one-way hike, but I could probably hitchhike in one of the directions at least part of the way. I thought about asking some of the other people in the hostel if they'd like to join me, but I knew nobody was going to want to walk 10 miles round-trip to the gold mine. Except.... Nicole had a car! She didn't have to walk to the mine--she could drive! And extra bonus for me--I wouldn't even have to hitchhike one way to make it a one-way hike. So I found Nicole. "Hey, Nicole--you interested in a gold mine tour?" She thought that sounded like a swell idea. We also asked a couple of others if they'd like to join us since she had more room in her car, but everyone else turned us down. It would be just the two of us. Shortly before we planned to leave, Jan--the proprietor of the hostel--asked if we could help her. She was trying to buy a truck, but had to drive all day to get to the seller and back and asked if we could check people in later that afternoon. She's a one-woman operation and had no employees to watch the place while she was gone. She didn't expect to get back until close to midnight, but she'd comp us a night for free at the hostel. Sure, why not? I've never worked at a hostel before, and I'm willing to try almost anything once in my life. Anyhow, it's not like I had anything better to do! Well, except for the gold mine tour, of course, but we'd finish that early and neither of us had any plans for the rest of the day. Jan gave us a quick tour of our responsibilities--where the towels were for people who came in just to shower, the reservation book (the names of people who were crossed out had already paid), where the cash was to make change for people, etc. The tour that most guests never get! Then Nicole and I piled into her car and we drove out to the Old Hundred gold mine. The tours start on the hour every hour throughout the day, and we only had to wait about 15 minutes to get in on the next tour. Besides Nicole and myself, just one other person had arrived for the tour. It would be a small group! This late in September was far off from the busy, tourist season. 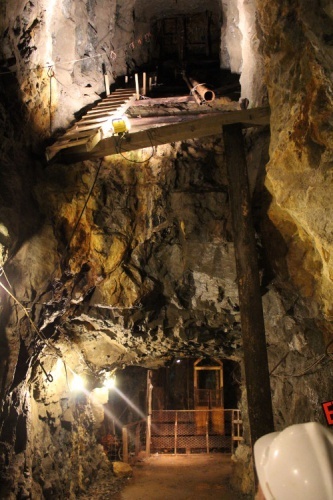 In fact, the mine was scheduled to close for the season in about a week. Had we arrived much later, we wouldn't have been able to do this tour at all. 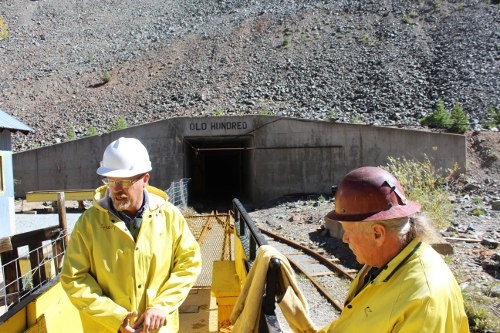 You can read about the long history of the mine at History of the Old Hundred Gold Mine--but to make a long story short, the mine was first started in 1872 and closed down for good in 1973. It reopened again as a tourist trap in the 1990s as I recall (that part isn't the history of the mine which only covered the history up until the mining activities ceased). The part of the mine that the tour covers are in the lower levels that were drilled between 1964 and 1973 at the end of the mine's life--and never made any money. 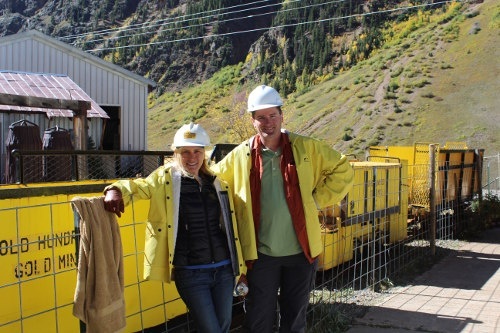 After paying the entrance fees, we were given yellow jackets and helmets to wear, and at the top of the hour, we boarded a small, vintage electric powered mine train used for hauling people around a mine which carried us about 1/3 of a mile into Galena Mountain. 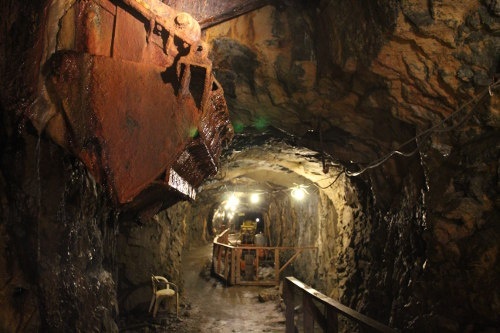 From there, we disembarked and traveled through the rest of the mine on foot. I've been in a number of mines before so I kind of knew what to expect. 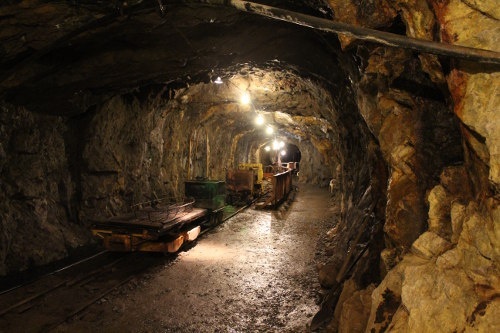 (It was the first mine that Nicole had visited, though.) But this mine had actual working mine equipment that they would turn on so we could see how it worked and how loud the equipment was. The man on the right was our tour guide. The man on the left was the one other person who was taking the tour, but I forget his name. (I never saw him in town--just during this tour.) We're on the electric train, about to head into the mine! At the end of the tour, we boarded the little electric train and were hauled back out under the sun. 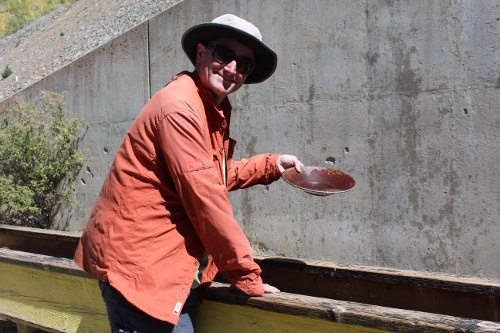 After the tour was over, we could "pan for gold" at a nearby sluice box--which was included with the price of the mine tour. Nicole seemed to think it was a waste of time ("You aren't going to find any gold in there! "she told me), but I knew they seeded the box with tiny amounts of gold, silver and copper. It wouldn't be worth much, but really, people don't do this to make fortunes--it's for the experience! So I panned a bit finding a couple of suspiciously shiny grains at the bottom, but I wasn't really sure what I had found. And truth be told, I didn't really care. When I was done, I poured it all back into the sluice box. I pan for gold after the tour is over, but I didn't find much and threw it all back! I guess that makes me a "catch and release" miner? We walked back to Nicole's car and she drove off. I, of course, wanted to walk back to town. The walk back was good and bad. The first half of the walk was on a gravel road which I didn't mind in principle, but it turned out to be a remarkably busy road with far more traffic than I ever imagined and I was annoyed at the clouds of dust each passing vehicle would throw up. But the walk itself was otherwise a beautiful one with lots of nice views, colorful aspen trees, and lots of the area's history described on various signs. There was even a small waterfall I noticed that I hadn't noticed on the drive out. The route also took me past the Mayflower Gold Mill tour which I was also keen to check out, but alas, it had already closed for the season a week before. I admired the exterior of the building but was a little sad that I wouldn't be able to tour it. I was disappointed that the Mayflower Gold Mill had already closed for the season, so I wouldn't be able to take a tour inside this place. 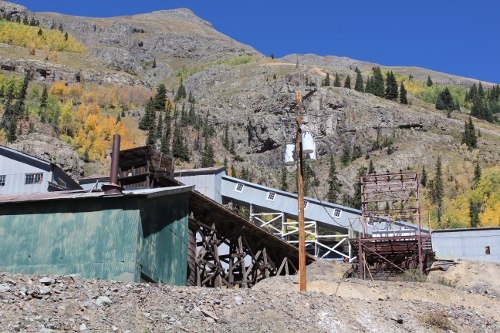 It was built in 1929 and produced over 1.5 million ounces of gold and 30 million ounces of silver, but closed when the last mine in the area closed in 1991. Fun fact: In 1997, the Mayflower Mill became the movie set for James Steward and Audie Murphy in the film Night Passage. A big gunfight was staged at the mill and the heroine escaped harm by riding a tram bucket to safety. 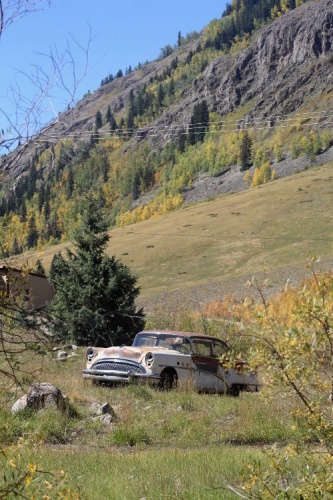 Silverton (and the area) has been the backdrop for a number of movies over the years! It was on the walk back that I also realized how windy the weather was. Wind gusts blew the hat right off my head, so I used the chin strap to keep in place. It might have been beautiful, but I had little doubt that hikers were practically being blown off the mountaintops today! Upon my arrival in town, I ordered lunch at a bar. I was feeling peckish by then, then headed back to the hostel by around 3:00 to take my "shift" watching the hostel. I figured Nicole was handling it until I got back, then she could take a break and tour around town or do whatever else she had planned for the day. I stopped for lunch here. She had checked several people into the hostel already, and I pulled out my laptop and sat in the lobby working until anyone came in needing help and chatting with the other people at the hostel. But a weird thing happened: nothing! Hour after hour went by, and nobody arrived to check in. 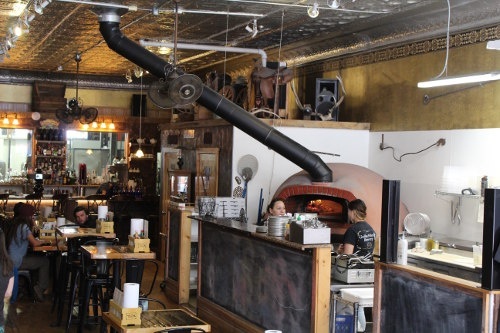 We knew there were something like half a dozen people who had made reservations but hadn't arrived yet, but nobody else checked in after I got back. I got up occasionally to stretch my legs, but had literally done absolutely no real "work" hours later. Nicole left for a bit, and even she seemed surprised when--at 10:00 at night--we still had all those missing people. Jan arrived back at about 10:30 that evening--quite a bit earlier than we had expected and it turned out the deal she was getting on that truck had fallen through and she turned back early. That must have been annoying, though, to drive all those hours for absolutely nothing. She asked Nicole and me how things were going, and we told her it was pretty boring. Nicole had checked a couple of people in early in the afternoon, but absolutely nobody had arrived since I'd been there since 3:00. And I swear--not five minutes later--all of the missing people showed up at once. It's almost as if they had been waiting around the corner for Jan to arrive. They weren't part of a large, single group that arrived together--just multiple groups that happened to arrive at the same time and surprisingly late in the evening. I worked some more on my laptop before eventually heading to sleep later in the evening. My second zero day in Silverton was officially over. More photos from inside the Old Hundred mine. On the walk back to town from the mine.